If your Jeep Grand Cherokee wasn’t powerful enough, the firm has just announced a 6.4 litre V8 powered SRT Red Vapor Limited Edition of its popular vehicle. The engine will provide breathtaking performance which will be capable of reaching from 0 to 62 mph in five seconds and it has a top speed of 160mph. Jeep says that its new limited edition will contest a place in the keenly fought sub-SUV segment and they have high hopes for it. Indeed, it was first unveiled in October at the Paris motor show to acclaim and now the Jeep Grand Cherokee SRT Red Vapor reaches our shores and is packed with extra kit and improved handling. For instance, Jeep have added anti-lock disc brakes, active damping suspension and an on demand four-wheel-drive system. They’ve also tweaked the exterior styling which includes black roof mouldings, body coloured door handles and sill extensions. Drivers will get to enjoy impressive handling on the vehicle’s 20inch five spoke Goliath wheels. Even though it’s a limited edition, the Jeep Grand Cherokee SRT Red Vapor is available in Brilliant Black, Bright White and Metallic Red. The interior features a leather steering wheel and gear change as well as leather and suede seats with red stitching. Jeep have also fitted their SRT badge on many interior and exterior surfaces. Standard kit includes adaptive cruise control, cross path detection, blind spot monitoring and an impressive sound system with 19 speakers. There’s also a powered tailgate and a rear light bar. 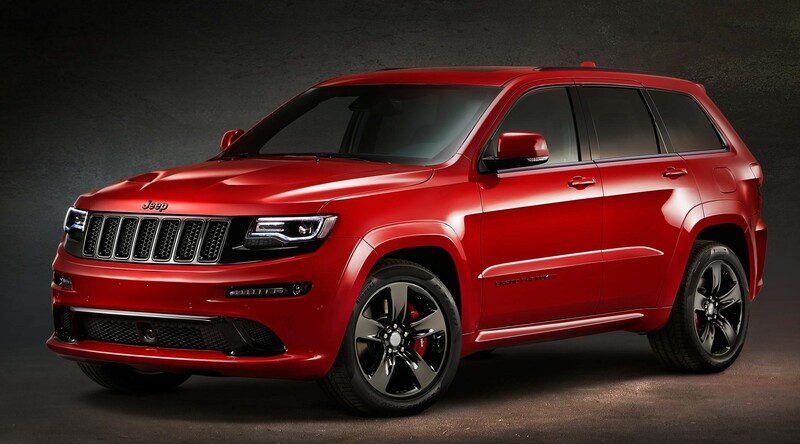 The Jeep Grand Cherokee SRT Red Vapor also comes with Bluetooth connectivity and an 8.4 inch touchscreen display which has 3-D navigation. The V8 engine is connected to an eight speed auto gearbox with paddle controls on the steering wheel. To help what could be a gas guzzler, Jeep have featured its ‘fuel saver’ technology to help improve economy and lower emissions. The new limited edition goes on sale this week and for the price of £64,999 it offers decent levels of performance and lots of equipment when compared with its competitors. This entry was posted in 4X4 Car, Car Leasing, Car Updates & Releases, Cars, Manufacturer News, New Cars, Performance Car and tagged jeep, Jeep Cherokee, Jeep Grand Cherokee, SRT by Steve Lumley. Bookmark the permalink.